Even a small sidelight can make a statement. The sidelights and transom add elegance to this entry. Inspired by a trip to Mexico! This lovely entrance window co-ordinates with others in the home. Custom bevels were designed to co-ordinate with the home-owners art work. A very large arched window co-ordinates with the entry design and adds beauty and privacy without obstructing the light. A grand entrance with a beautiful combination of door and transom design. A unique way to highlight your house number. This lovely scrolled wrought iron design was created with lead. Faux Iron can be a great light-weight solution for those high transoms over an entranceway. Inspiration can come from anywhere - even the family pet! A beautiful and unique subject for a door insert. SGO Iron Art adds interest to the transom above solid wood doors. Looking for a solution for transom windows when the door and sidelights already have decorative glass? SGO Iron Art can compliment them beautifully. A light look in traditional wrought iron. Previously a solid door, it was cut out to accomodate this contemporary design. This design had a special significance for our clients and was adapted to combine with the existing mullions in the windows. Textured glass in the sidelight and transom gives privacy while complimenting the contemporary door design. This elegant entry co-ordinates with the design in tall windows on the opposite side of the entry hall. Decorative glass allows natural light to always shine through while maintaining privacy. A grape design adds character to this wine cellar entrance. SGO Iron Art combines well with obscure glass for privacy in this interior door. A contemporary design from our standard SGO collection. This simple but classic design from our standard SGO collection offers exceptional privacy. A simple transom design completes the look - from our SGO collection. A plain entry is transformed by beautiful glass. A beautiful Ultraglas Baroque door design. Textures & bevels were chosen specifically to overcome a lack of privacy at the front door. This pretty design incorporates a few bevels for sparkle along with privacy. Combined textures add beautiful interest to these Ultraglas door panels. An example of the amazing painted detail that can be combined with carving. Another example of the Carved & Painted artistry on the previous doors. A contemporary door design in carved and backpainted glass. This traditional cut stained glass is anything but traditional! A combination of textured glass and bevels add definition to the design. Much needed privacy is added with a Stained Glass Overlay treatment. Design & colour were inspired by another window original to this century home. One of our standard design options. SGO Iron Art & textured glass combine in this door between the kitchen & dining room. Custom traditional stained glass door panel in a Celtic design. 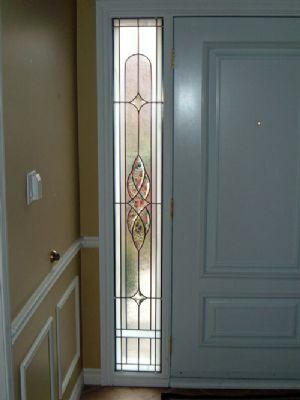 These antique doors were made much more energy efficient with Stained Glass Overlay.